I have seen questions being migrated to other different stack exchange sites. How is this process happens? How to suggest them to be migrated to other stack exchange site? It becomes available only after certain privilege level or only moderators can do it? I'm not sure what the proper process should be for the scenario you've outlined - one of the mods may be able to provide a definitive answer. What I normally end up doing is flag as off-topic, then use the "Other (add a comment explaining what is wrong)" option, and then manually suggest the other site that it should be migrated to. Again, this may or may not be the most desirable way of doing things. EDIT: as per a linked answer in @greenonline's post , apparently this feature is only available for moderators. 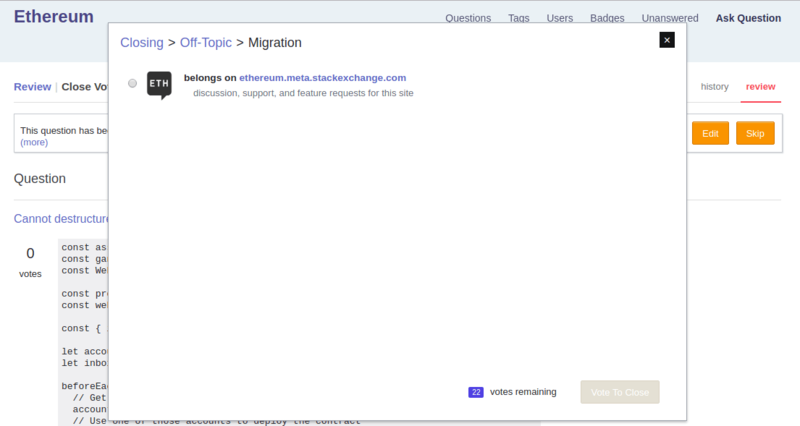 Migrating to an arbitrary stack exchange site This is only an option for ♦ moderators, so instead of voting to close the question † you should flag it for moderator attention ‡ with a suggestion of where it should be migrated. The above provided solution of manually suggesting the site by using other option or flagging for moderator intervention are the options. It is because SE.Ethereum is still in beta. When it graduates, then more options will become available in that dialog to which you refer. See this answer to Why does the migrate dialog only list Arduino Meta? Do we want to participate in Winter Bash 2016?